2 stretchers + 3 passengers. Aboard, you will find special oxygen, power supply and a drip stand. A special loading ramp will help you facilitate the boarding of patients. 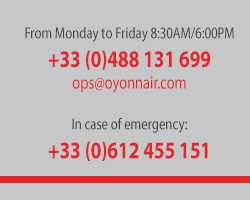 Want to plan a flight with Oyonnair? Pictures Copyrights: FLYFR@NCE, Elisabeth Kristensen, Geoffrey Lacroix, Raphaël Pantano.